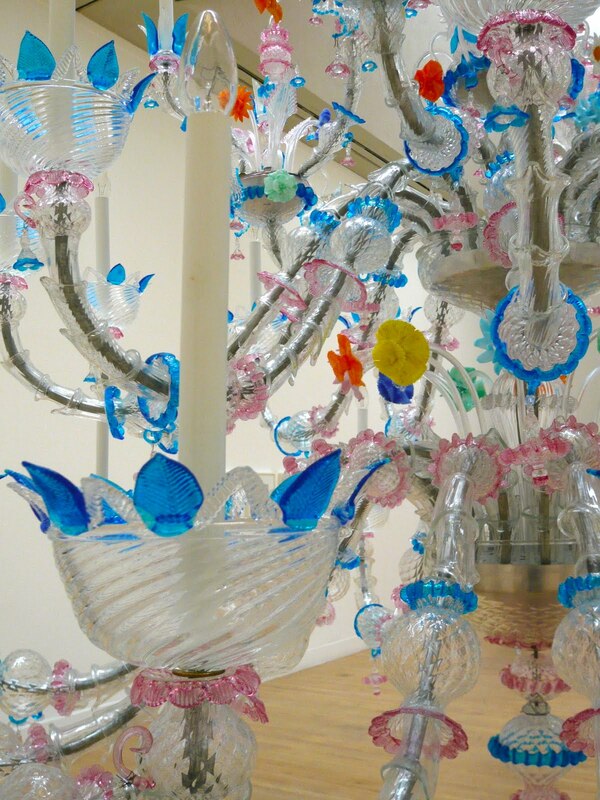 The chandelier is large and what I can only really describe as frilly, or flouncy maybe; the combination of the colours and the twiddliness of the glass give this a somewhat kitsch feel though it’s Venetian glass rather than mass-produced plastic. 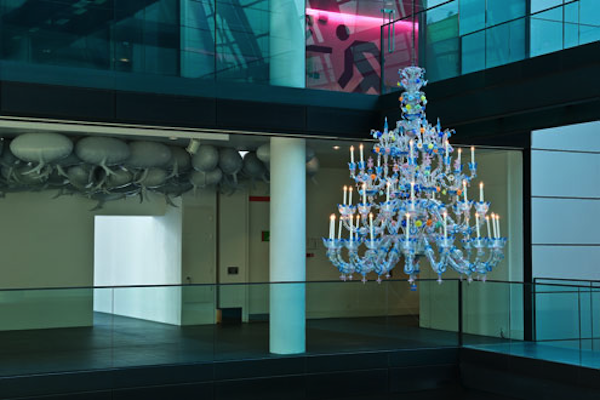 In Bloomberg SPACE there’s a pleasing mismatch between the oddity of the elaborate, highly decorative chandelier and the efficient feel of the building and in my view the piece works better here than in a white walled gallery space (the piece is now in the Tate collection and I last saw it in Tate Britain a year or two ago). Conveniently for those who need assistance – and I imagine the overlap between those who understand morse code and the audience for contemporary art is vanishingly small – the text is relayed letter by letter from the flashing light to a small monitor on the wall, setting up a further disjuncture. Given that the text goes into great detail about the technical aspects of astronomical photography, it’s also possible few will actively want to read it but delivered in this way it becomes somehow quite compelling. As the morse code unit seems to almost stutter over its translation, the experience of reading the text is much more tense than the subject matter warrants and I found myself reading for rather longer than I would have expected. 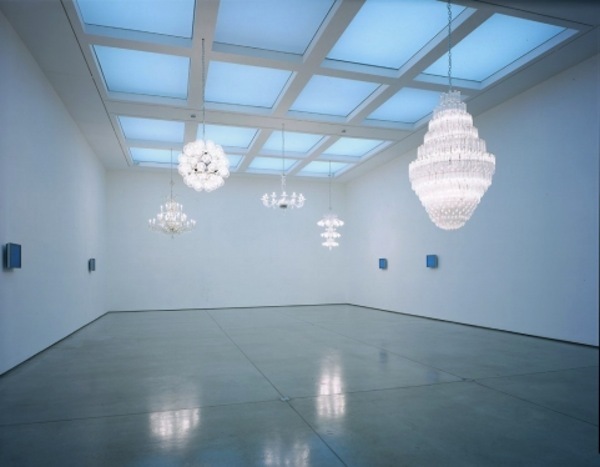 I first saw chandelier works by Cerith Wyn Evans at White Cube in 2003. Here the lights were simpler insomuch as they were all plain crystal rather than coloured glass (let’s face it, by their nature chandeliers are never really simple and some of these were pretty intricate). Here each light was emitting a different text – including essays by Theodor Adorno and John Cage – silently speaking over one another, each determinedly sticking to its own reading, inviting us to engage with the text but providing a wilfully inadequate opportunity for us to do so. 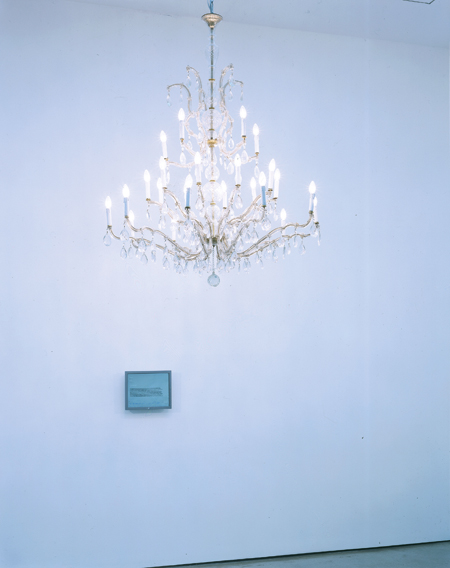 This entry was posted in Installation, Light, Sculpture, Technology and tagged art, Astrophotography..., Astrophotography...The Traditional Measure of Photographic Speed in Astronomy...' by Siegfried Marx (1987), Cerith Wyn Evans, installation, Look at that picture. How does it appear to you? Does it seem to be persisting?, sculpture by Ann Jones. Bookmark the permalink.